Municipal waste, commonly known as trash or garbage, is a combination of all of a city's solid and semisolid waste. It includes mainly household or domestic waste, but it can also contain commercial and industrial waste with the exception of industrial hazardous waste (waste from industrial practices that causes a threat to human or environmental health). Industrial hazardous waste is excluded from municipal waste because it is typically dealt with separately based on environmental regulations. The second category of municipal waste is recyclable materials. Paper is also included in this category but non-biodegradable items like glass, plastic bottles, other plastics, metals and aluminum cans fall into this section as well. Inert waste is the third category of municipal waste. For reference, when discussed with municipal waste, inert materials are those that are not necessarily toxic to all species but can be harmful or toxic to humans. Therefore, construction and demolition waste is often categorized as inert waste. Composite waste is the fourth category of municipal waste and includes items that are composed of more than one material. For example, clothing and plastics such as children's toys are composite waste. Household hazardous waste is the final category of municipal waste. This includes medicines, paint, batteries, light bulbs, fertilizer and pesticide containers and e-waste like old computers, printers, and cellular phones. Household hazardous waste cannot be recycled or disposed of with other waste categories so many cities offer residents other options for hazardous waste disposal. 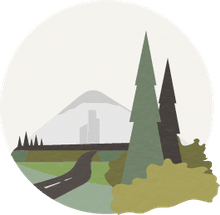 Today, landfills are engineered to protect the environment and prevent pollutants from entering the soil and possibly polluting ground water in one of two ways. The first of these is with the use of a clay liner to block pollutants from leaving the landfill. These are called sanitary landfills while the second type is called a municipal solid waste landfill. 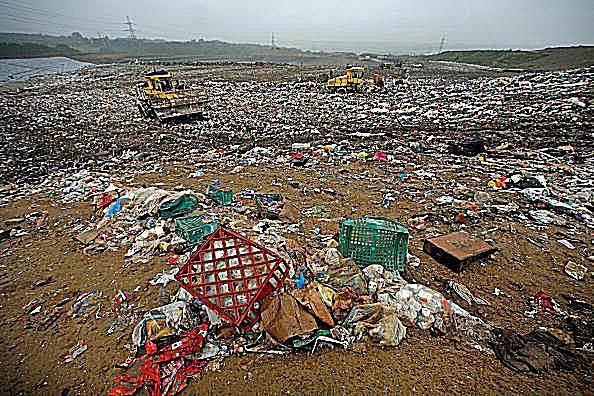 These types of landfills use synthetic liners like plastic to separate the landfill's trash from the land below it. Once trash is put into these landfills, it is compacted until the areas is full, at which time the trash is buried. This is done to prevent the trash from contacting the environment but also to keep it dry and out of contact with air so it will not quickly decompose. About 55% of the waste generated in the United States goes to landfills while around 90% of waste created in the United Kingdom is disposed in this manner. In addition to landfills, waste can also be disposed using waste combustors. This involves the burning of municipal waste at extremely high temperatures to reduce waste volume, control bacteria, and sometimes generate electricity. Air pollution from the combustion is sometimes a concern with this type of waste disposal but governments have regulations to reduce pollution. Scrubbers (devices that spray liquids on smoke to reduce pollution) and filters (screens to remove ash and pollutant particles) are commonly used today. Finally, transfer stations are the third type of municipal waste disposal currently in use. These are facilities that where municipal waste is unloaded and sorted to remove recyclables and hazardous materials. The remaining waste is then reloaded onto trucks and taken to landfills while the waste that can be recycled for example, is sent to recycling centers. Composting is another way cities can promote municipal waste reduction. This type of waste is comprised solely of biodegradable organic waste like food scraps and yard trimmings. Composting is generally done on the individual level and involves the combination of organic waste with microorganisms like bacteria and fungi that break down the waste and create compost. This can then be recycled and used as a natural and chemical free fertilizer for personal plants. Along with recycling programs and composting, municipal waste can be reduced via source reduction. This involves the reduction of waste through the alteration of manufacturing practices to reduce the creation excess materials which get turned into waste. To further reduce waste, some cities are currently promoting policies of zero waste. Zero waste itself means reduced waste generation and the 100% diversion of the remainder of waste from landfills to productive uses via materials reuse, recycling, repair and composting. Zero waste products should also have minimal negative environmental impacts over their lifecycles.